The entire January 2016 range is now available from LEGO [email protected] and in brand retail stores. 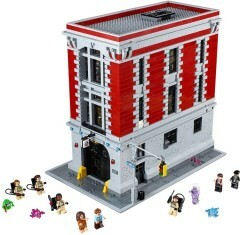 This includes the highly-anticipated direct-to-consumer sets 10251 Brick Bank and 75827 Ghostbusters Firehouse Headquarters. You can take a look at a full list of the new sets here, although it may take a few minutes for the list to update to include the most recent sets. UPDATE (00.18): It appears that the prices of some sets are being inflated when you reach the checkout while others are being reduced. I suspect this may be the first of many issues to come, perhaps enough to beat last year's debacle! UPDATE (11:28): Everything seems go be back to normal. Let's see how long it stays that way.